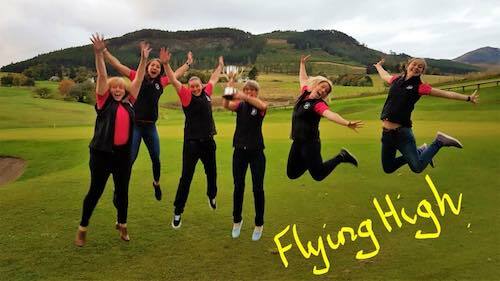 W E L C O M E to the website of Pitlochry Golf Club Ladies Section. Please use this website to get to know us (also find us on Facebook at the Pitlochry Golf Club Page). Whether you are a prospective or existing member, we hope you enjoy keeping up to date with our ladies news and events. On 26th August, we held our Ladies Open day and, unfortunately, it happened to be the wettest, coldest day of the summer to date. We had 60 entries and we were grateful to find that 50 of these ladies braved the conditions and took to the course. We had 2 ladies who played below the CSS of 73. 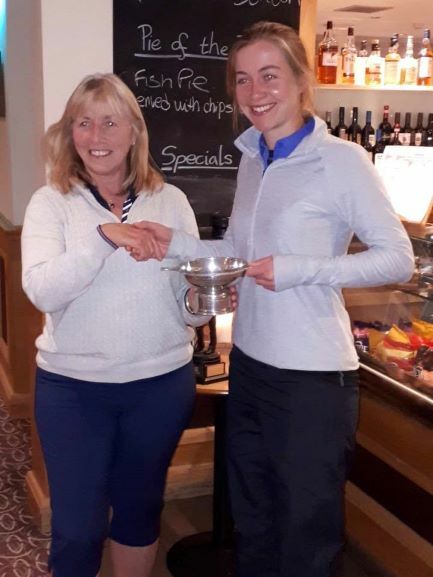 Karen Will (Aberfeldy) with a fantastic scratch score of 77 winning the Scratch Trophy and Jenny Collins (Pitlochry) nett 72 (8) winning the Handicap Quaich. Thank you to all who supported our day in such bad weather. For winners and full results please click here. 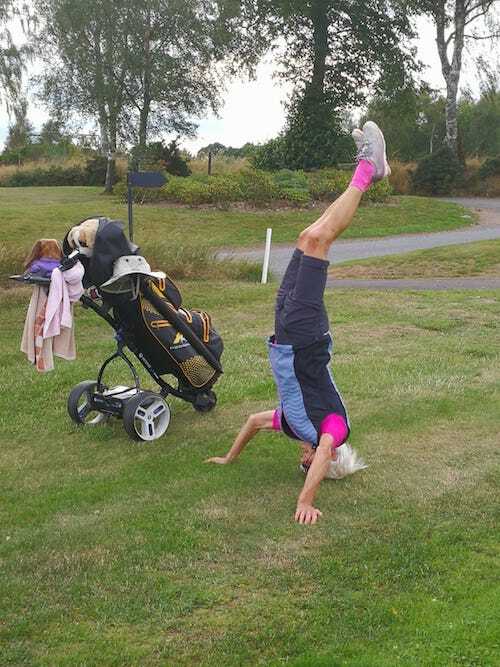 The Ladies Club Championship finals were held on 12th August. Both matches produced some great golf and close scoring. In the bronze section, Audrey Smith beat Jane Burnett on the 16th. In the scratch section, Isla Moncrieff retained her title beating Caroline Henderson 2&1. Well played to all! 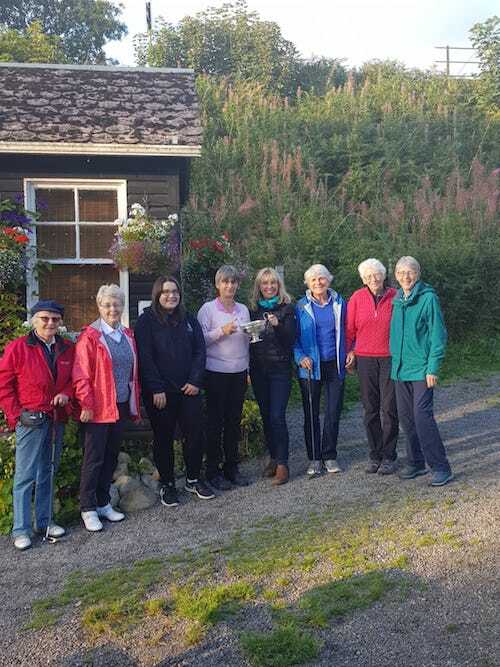 With the men enjoying Highland week at Pitlochry in early August, the Ladies club ventured elsewhere for some competition. The outing was well attended at Strathmore yesterday, with 28 ladies taking part. Winners on the day were Louise Kelly (overall 42 points), Caroline Henderson (silver 38 points) and Ann Mailer (bronze 39 points). Photo below showing the pre golf yoga warm up! Our annual putting competition was held in lovely sunshine on 8th August. It was a very close competition with Janette Kennedy retaining her title, beating Lauren Pirie in a repeat of last years final. 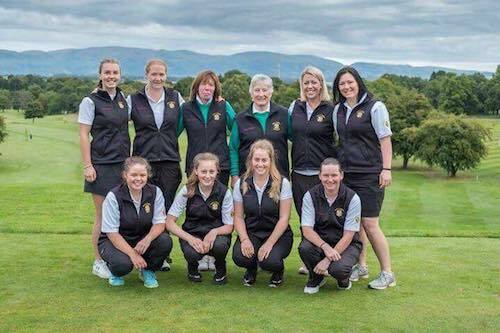 Perth & Kinross Ladies County Golf - Isla Moncrieff & Laura Campbell were selected as part of the 8 man P&K team for the Inter County Championship at Strathmore 16-18 June. P&K beat Angus on Saturday 6-3, with Isla winning her Foursomes in the morning 3&1 and in the afternoon Singles Laura won 3&2 and Isla 5&4. P&K beat Northern Counties on Sunday 7-2, with Isla winning her morning Foursomes 1 Up and Laura winning her afternoon Singles 4&2. Going into the final day to play Aberdeenshire both teams were tied on points, but Aberdeenshire won 8-1 to win the trophy, with Isla losing 3&1 in the Foursomes & Laura 2&1 in the Singles. Daily Mail Foursomes -Kay Knight & Jenny Collins lost narrowly to Aberfeldy (Caroline Henderson and Susie MacDougall - also Pitlochry members) at the 20th hole in Round 4 at Pitlochry. 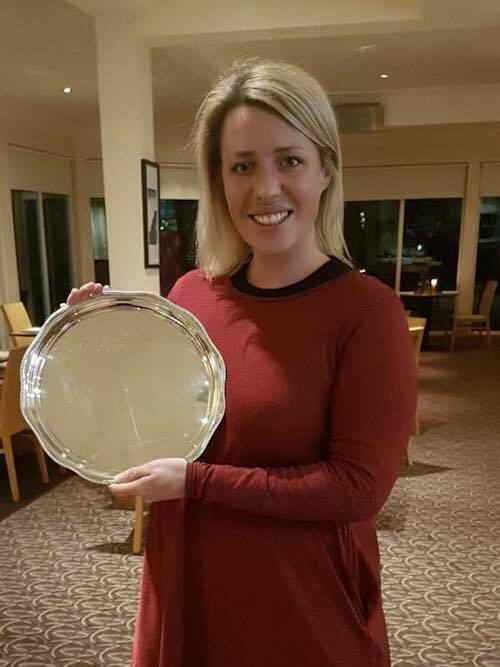 The Perth & Kinross Ladies County Golf Association County Championships were held at Blairgowrie on 7th &12th May, with 8 Pitlochry members taking part. Laura Campbell, Caroline Henderson & Isla Moncrieff qualified in the top 16 for the knockout stages of the Scratch Championship, but unfortunately Laura was unable to play in the matchplay due to work commitments. Caroline lost 2&1 and Isla 5&4. 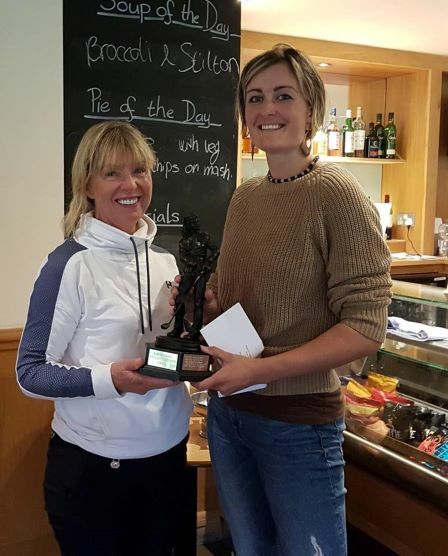 Alison Walker and Helen Lang qualified for the Gibb Trophy (handicap) knockout stages where Alison lost (1 hole) and Helen won (2 holes), but lost (4&3) in the Semis. Well played to all! In the Daily Mail Foursomes, Kay Knight & Jenny Collins beat Blair Atholl 1 up in Round 2 at Pitlochry. In Round 3 they beat Ladybank Golf Club 4&3 at Pitlochry. Round 4 has drawn another home tie, this time against Aberfeldy to be played in June. Club Competitions - With the season in full swing, we are getting a good turnout for our competitions. So far we have had eight different winners for the ten competitions. Keep up the good golf! 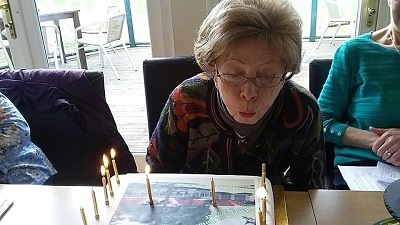 We celebrated the 80th Birthday of Margaret Macrae. 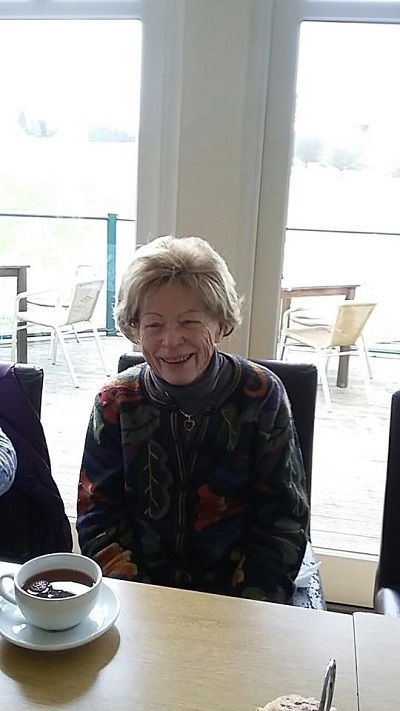 Margaret is a past lady captain, past club champion ( on numerous occasions) and a long standing member of the club - 48 years to be exact! A great role model for the club she was presented with a lovely photo collage by our current lady captain, Louise Kelly. A delicious afternoon tea was provided by Cargills Clubhouse. 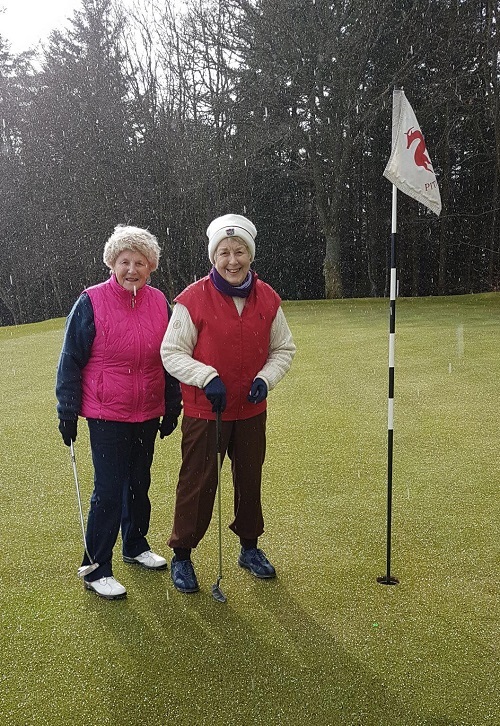 After the snow storms in March, there was a short break in the weather for the Ladies Opening Day Captain v Vice Captain. The hailstones didn't stop us though! A fantastic turnout, some great golf and a narrow win for Captain Louise Kelly. 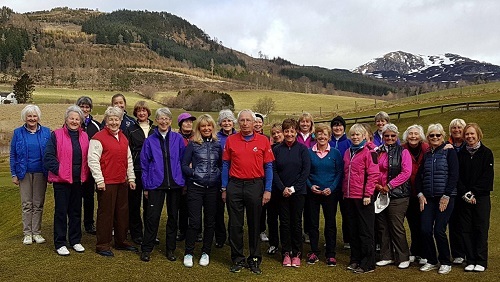 In January, 34 lady golfers from Pitlochry and Blair Atholl joined to celebrate the 80th Birthday of Marianne Carruthers. 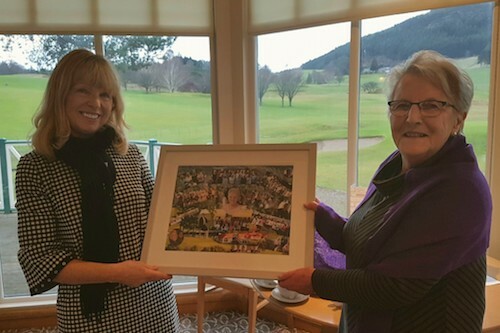 Our lady captain, Louise Kelly, presented Marianne with a lovely framed photo. With December bringing a cold snap to Pitlochry there was not much golf to be had! 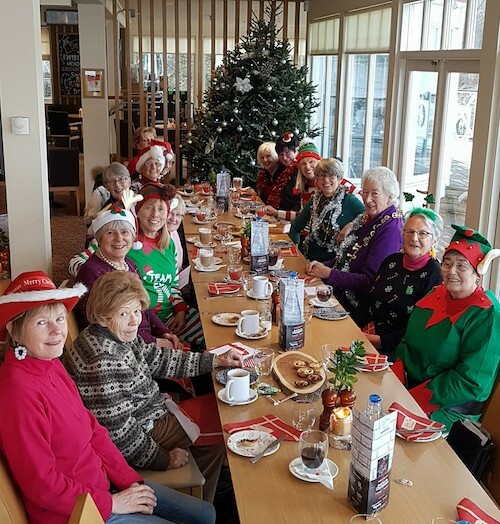 Instead, a fun lunch at the club house with many getting in the festive spirit! The 2017 annual dinner and prize giving was held in November with much silverware to be won! Louise Kelly thanked and congratulated Jean Bates on her successful captaincy, as she picked up the baton herself. Margaret Chalmers was delighted to be asked to present the trophies this year. It marked the 50th anniversary of her own success, winning the Ladies Highland Open in 1967! Top - Ladies enjoying the prize giving dinner - lots of happy faces! Below - 2017 Club Champion Isla Moncrieff. The Perth and Kinross Champion of Champions was held at Murrayshall on 8th October. 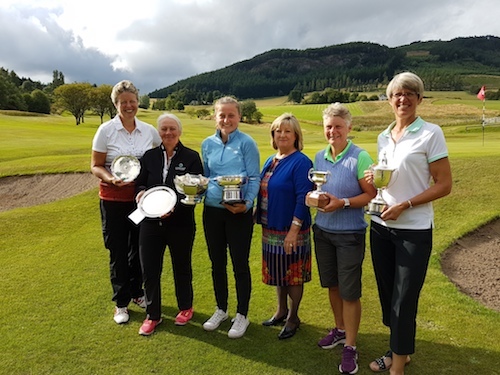 The ladies section had three representatives - Isla Moncrieff (Pitlochry), Jenny Collins (Blair Atholl) and Lynn McDonald (Strathtay). 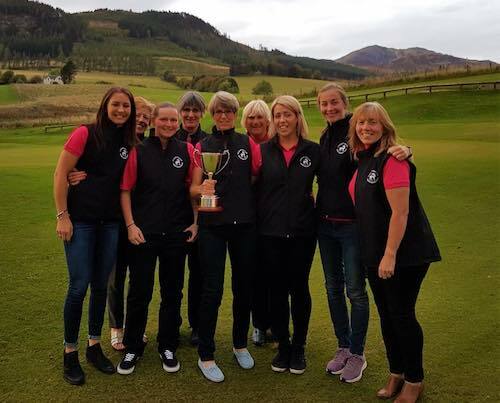 In 2017, the ladies Scratch League Team won the Perth and Kinross League for the first time in its 25 year history. 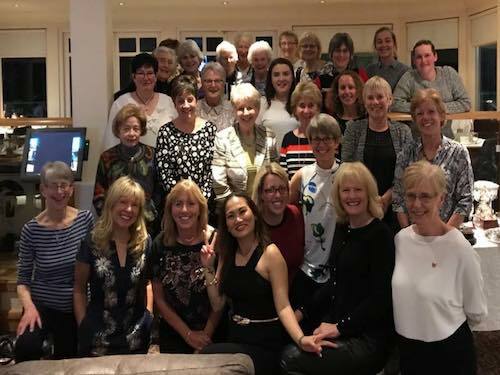 To celebrate their stunning success, Jean Bates (retiring ladies club captain) presented the Pitlochry Ladies with a framed photo for display in the locker room at their celebration meal. (Left to right - top) Kathleen Duncan, Eve Muirhead, Laura Campbell, Kay Knight (team captain), Isla Moncrieff and Jenny Collins. (bottom) Also joining in the fun at the celebration meal were trusty reserves Gillian Munro, Janette Kennedy and Sue Caton. Also in September, the ladies section had two representatives competing in the Scottish Women's County Finals at Glenbervie. Laura Campbell and Isla Moncrieff were part of the Perth and Kinross team who finished third in the table. With a young team, they will hope to build on their experience for next year. Perth and Kinross County team. Pitlochry members Isla Moncrieff (back row second from right) and Laura Campbell (front row far right).